These homemade custard recipes make the best egg custards you have ever tasted. They're deliciously smooth, rich, and creamy, and they taste ever so much better than those made from any store-bought mix. They are truly worth the little extra time it takes to make them. 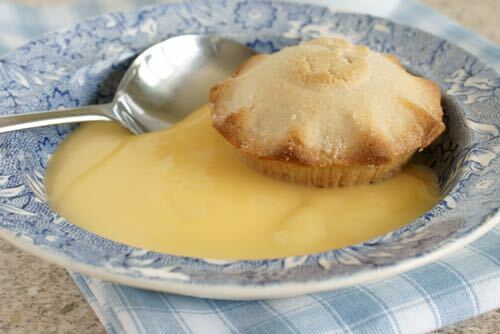 Custard as we know it today dates from the Medieval Era when it was enjoyed on its own or used as a creamy filling in tarts and pies, much as it's still enjoyed today. They make a rich-tasting filling or creamy sauce for other desserts. 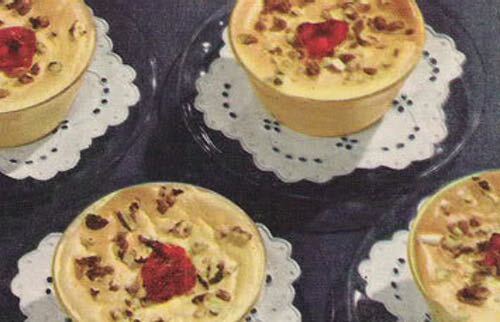 Treat your family to some authentic, old fashioned egg custard desserts. I will venture a boiled custard recipe (perhaps it should be granted that everyone knows how to make it), as it is so often used in making many kinds of dessert, and as an excellent sauce for several puddings. It is considered better made of the yolks only of the eggs (some whites may be used, however). A dessertspoonful of sugar is enough for each egg, and five yolks are quite sufficient for a quart of milk. 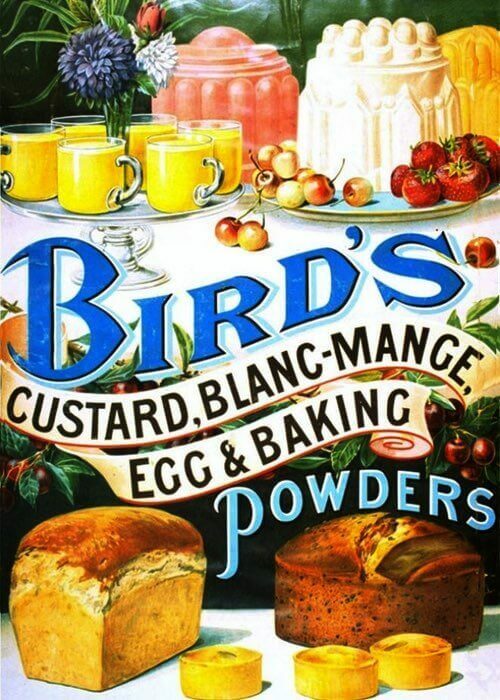 Beat the yolks and the sugar together to a froth, and stir in the milk; put it into a custard boiler, or, if one has none, into a small tin pail. Place this in a kettle of boiling water; stir the mixture constantly until it is a little thickened. 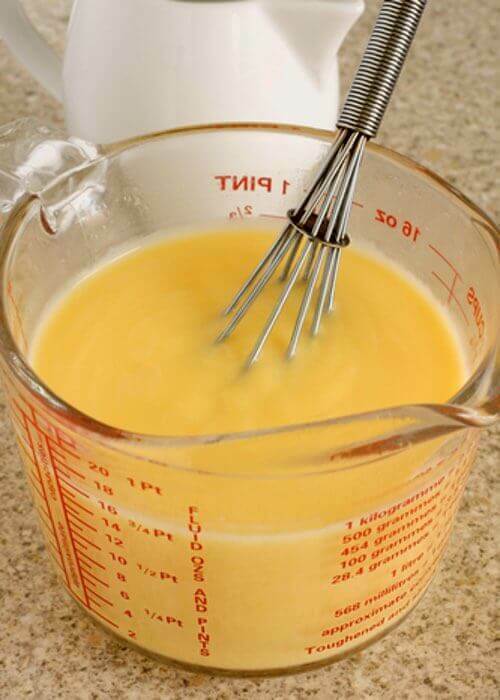 If it is well stirred, the custard will be a smooth cream; if allowed to remain a few moments too long in the boiling water after it begins to thicken, it will curdle, and be spoiled. Do not flavor it with any of the essences, wines, or brandy, until after it is cooked; if either a vanilla bean or peach leaves are used, cook them with the custard. If the whole eggs are preferred, for economy's sake, to be used (and they make very good custard), allow four eggs to a quart of milk, and four dessertspoonfuls of sugar. If the milk is first boiled before it is added to the other ingredients, there will be less danger of the mixture curdling. Beat the yolks of three eggs very lightly; stir into them two small tablespoonfuls of cornstarch, dissolved in a little milk, and one teacupful of sugar. Bring two quarts of milk to a boil, then take it off the fire; pour it into the eggs, etc., a little at first; return it to the fire, and stir it until it thickens, not allowing it to boil; let it remain long enough to well cook the starch. One cup half and half or 1 cup light whipping cream can be substituted, but for the closest flavor to evaporated milk, gently simmer 2-1/4 cups whole milk in a saucepan until reduced to 1 cup. Recipe makes 2 custard servings. 1. Turn on oven; set at slow (325°F). 2. Mix together 1 slightly beaten egg yolk, 1-1/2 tablespoons brown sugar, pinch of salt, 1/2 teaspoon vanilla extract. 3. Stir in mixture of 1/2 cup PET Evaporated Milk, 2 tablespoons water. 4. Beat until stiff, but not dry 1 egg white. 5. Continue beating while adding 1-1/2 tablespoons brown sugar. 6. Fold milk mixture slowly into egg white mixture. Pour into 2 custard cups. 7. Sprinkle over top 1-1/2 tablespoons chopped nuts. 8. Set in pan containing about 1/2 inch of hot water. 9. Bake 45 minutes, or until knife inserted near outer edge comes out clean. 10. Cool; garnish if desired, with equal portions of 1 teaspoon jelly or marmalade. Beat six eggs well, add six tablespoonfuls of sugar, beat it well with the eggs; boil three pints of milk, pour it over the eggs, but be sure to stir them all the time, or it will be apt to curdle; put it back in the saucepan; stir it a few moments, over the fire, take it off, stir it until nearly cool.